The greater Himalayas provide a vital water supply for over 1.5 billion people, and as a result, climatic change in the source areas of Asia’s main rivers will have a great societal impact. Not only are the Himalayan water resources a crucial asset, but the steep terrain in combination with extreme climatic conditions cause frequent natural disasters, such as landslides, floods and glacier lake outbursts. In June 2013, for example, extreme rainfall resulted in devastating floods and landslides killing over 5000 people in the Indian Himalayas. Clearly, the stakes are high, and an accurate understanding of the Himalayan water cycle is urgently needed. Unfortunately, the hydrology of the greater Himalayas is only marginally resolved due to the intricacy of monsoon dynamics, the poorly quantified dependence on the cryosphere and the physical constraints of doing research in high-altitude and generally inaccessible terrain. The main reason for the current lack of understanding about the future of Himalayan glaciers and downstream water resources is the huge scale gap that exists between studies of individual glaciers that are not representative of the entire region and hydrological modelling studies that represent the variability in Himalayan climates. Unraveling climate dynamics at high-altitude and precipitation patterns in particular, is one of the largest quests in understanding greater Himalayan hydrology. The central Himalayan region is dominated by a monsoon climate, in which most of the precipitation is concentrated during summer (June to September), while winters are rather dry. The interaction between topography and precipitation is, however, complex and manifests itself at various scales ranging from a synoptic scale of several hundreds of kilometres to an orographic meso-scale of less than 30 kilometres. From east to west, the monsoon influence decreases and mid-latitude westerlies become more important in the western part of the greater Himalaya (Pamir and Karakoram ranges). Precipitation from the westerlies is highest in winter when low-pressure systems reach the western margin of the greater Himalaya. Understanding these regional differences is hampered by the lack of high altitude observations. Moreover, commonly used gridded precipitation products are grossly inaccurate at high altitudes and possess a resolution that is much too coarse to be of use for high-resolution hydrological assessments. Understanding future changes in climate in the greater Himalaya is an even larger challenge. There is great scientific (and societal) debate about the cryospheric response to climate change in Asia, caused by lack of data and the limited amount of studies. Most Himalayan glaciers are seemingly losing mass at rates similar to glaciers elsewhere, except for emerging indications of stability or mass gain in the western part of the greater Himalaya, e.g. in the Pamir and Karakoram ranges, during the last decade. This so called Karakoram-Pamir anomaly remains largely unexplained due to the poor understanding of the processes controlling the glacier mass balances. Glacio-hydrological model applications in the Himalayas have considerable shortcomings as detailed ice flow dynamics are not included; key hydrological processes such snow maturation, sublimation, subsurface storage and flow are lacking; and variation in glacier surface properties are insufficiently represented. In addition, the future evolution of glaciers is poorly parameterized and the feedbacks between the atmospheric processes and the cryosphere are not represented. This impairs the systematic understanding of the future hydrological response. Understand how climate controls key glacio-hydrological processes in high-altitude catchments in particular ice flow and melt dynamics of debris covered glaciers, snow maturation and sublimation and routing of (sub-surface) runoff. 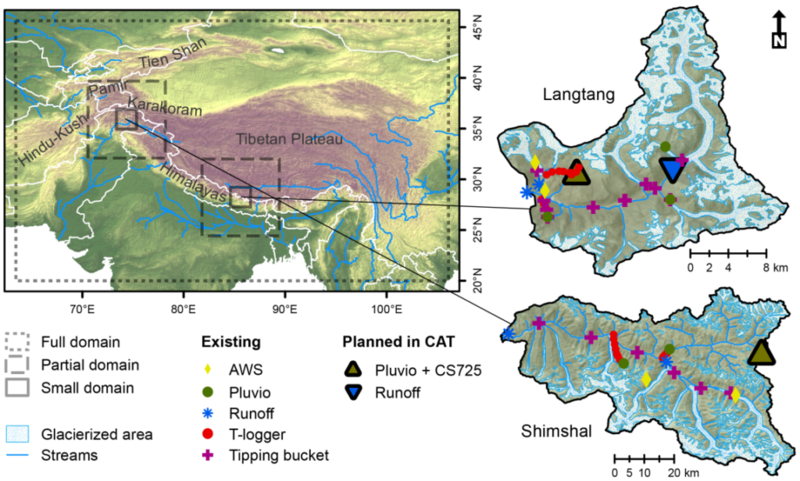 Explain regional differences and their consequences for accurate projections of future changes in greater Himalayan glacio-hydrology by implementing catchment scale glacial-hydrological models for two representative, but contrasting catchments at a resolution that allows inclusion of key local-scale glacio-hydrological processes and atmospheric dynamics. In CAT a team of 4 researchers will address those objectives by setting-up novel high resolution atmospheric models, acquisition of field data on snow, rain, runoff and glacier properties will be studied using drones and satellite imagery. All this information will be integrated together with satellite remote sensing data into catchment scale glacio-hydrological models. The research will be executed in two contrasting catchment in the Karakoram and the Himalayas. Map showing the modelling domains and the planned measurement equipment for the two study areas in the Himalaya and Karakoram.